And just because the exact date of my birthday has passed, doesn’t mean that good things will stop coming, right? As a matter of fact, good things are just about to come, not just for me, but for all of my blog readers. I have been doing blog collaboration with HBC for a year now, and I’m a firm believer of their campaigns and a supporter of the said brand. Actually, not just their brand; you all know for a fact how I’m all for local branded beauty products, right? And of course, as my blog readers, I’d also want you to feel the same way as I do – that locally branded beauty products can compete internationally too! That is why we, as the consumers, should try them out, and voice out our opinion as to what we think should be improved still and such things. That’s what we, beauty bloggers, are actually already doing. 1. What’s your favourite HBC product? 2. How can you be beautiful inside and out? Best answer will win the HBC Beauty Loot. 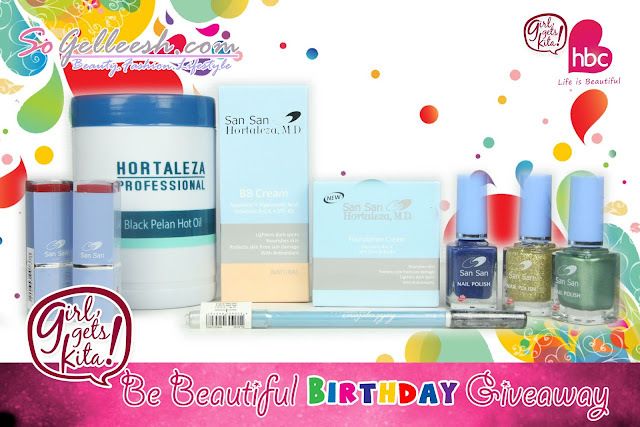 The giveaway will end on September 30, 2013 and only my Philippine-based blog readers who are willing to pick up their prize at their nearest HBC branch can join this giveaway. Thank you HBC for the continuous support in my blog and for sponsoring this giveaway. And also to all my readers who have stayed, and continued visiting and supporting my blog even though I don’t post every day. I just always want to have something meaningful to share with you all when I put up a blog post may it be a simple product review or an FOTD/OOTD post. I have actually been kind of brain dead lately with regard to writing. You know how my full-time job requires me to do writing as well so it can also be quite tasking for me at times to push out more thoughts for my blog. But, when I feel like it, when I feel like I have something to share to you guys, I can just pour it all out. Anyway, this is a giveaway post but I’m getting too dramatic. Haha! Enjoy and good luck! Keep your house clutter free. Avoid watching movies (horror or violence) before bedtime. Go to bed before 11pm. Answer #2:Love who you are, everything from your body to your personality.Be conFident, live lovingly, compassionately, gracefully, honorably, joyfully and smile always. Answer #1: I honestly haven't tried any SANSAN Products so I'm joining this contest to probably find one that's good for me. I think their BB Cream and Matte Lipstick is one I want to try out. Answer #1: My favorite HBC products are their nailpolish. I love how the formula always goes on so smoothly with the perfect consistency, plus it dries really fast and can last a week for me without chipping even if I don't use a top coat! I'm not very good at doing my nails sometimes, but it's so much easier with their particular brand of nailpolish. It's so affordable too! I can easily buy 2-3 shades at a time. Answer #2: To be beautiful inside and out, I believe in utilizing two things: a positive mindset and great beauty products. If I -feel- confident, I know I'll see myself as confident inside and out. Using great beauty products and makeup, like from HBC with their foundation and blush, also helps me to easily feel beautiful both ways. Answer #1: I really love thier Nail Polish, lipstick and also the BB Cream. The BB cream helps me a lot especially in moisturizing my face and it helps me protect me from sunlight. Every time i put BB cream I feel beautiful. Answer #2: Being beautiful inside and out for me is to stay healthy. I always eat healthy foods, every day I do exercising, I smile, I'm keeping my heart open to other people, I really keep my authenticity and I always look in the Mirror and say "I am Beautiful, just the way I am." Answer #2:be stress-free.matulog ng tamang oras.drink enought water,eat right amount of food. Answer #2: Smile and the whole world will smile back at you. Beauty is skin deep so how good you feel about yourself reflects outwards. Answer #1:I love their nail polish & lip gloss. It looks me fab & classy! Answer #2: Being beautiful inside & out means to wear a smile always. To stay healthy, exercise well & be positive in whatever means. ANSWER #2: Just Love who you are, everything from your body to your personality. Learn to have confidence in yourself without becoming self-indulgent or arrogant, as this is not the mark of true inner and outer beauty.Define and live by your own personal belief and value system.You will also seem like a more genuine person to others if you practice what you preach. Answer #1: i love san san lipstick.ive tried it and its my mom's. i loved it. 1. Sansan Lipstick and face power! 2. Just be yourself, unique and be goal oriented! And have a heart of gold! You always carry yourself lightly! Answer #1: My favorite HBC product is their Coconut hair conditioner! It does worked well for my hair and it smells so good! Answer #1: San San Nail Polishes! I love the colors and the application is good. Answer #2: The golden rule has always been my mantra: do unto others what you would want done unto you. Being beautiful inside and out just means that it is your choice how you treat others. Be excellent and compassionate to all, and that is how you will be treated in kind. Answer #1.I love HBC's Body Recipe's Pure Coco Oil Bar Soap,bought once and I love the results,it leaves my skin soft and smooth. Answer #2.Living a stress and worry free life as much as I can.Throw away all the negative vibes and you'll feel beautiful inside and out. Answer #1: What’s your favourite HBC product? My favorite would be San-san's eyeliner pen in black. Answer #2: How can you be beautiful inside and out? Always take care of one's body by eating healthy foods and regular exercise. Always have a positive look in life and don't forget to smile. Answer #2: I make it sure I will live a stress and worry free life. Smile and positive vibes to make my day complete. Answer #1: I super love the HBC henna temporary hair color and their nail polish because they have nice color range and what I love about San San nail polishes is that they dry fast. Answer #2: Stretch yourself and wake up and sit on your bed with a very beautiful and confident smile. Thank God for giving you such a beautiful life and such a beautiful morning. Answer #2: contentment, confidence and believing in oneself makes a person beautiful inside and out. no matter how u look, as long as u believe in urself that u'r beautiful, then people wud also believe that u are beautiful. and lastly, being beautiful on the outside is useless if u'r ugly on the inside. being beautiful is to be able to influence others that they're also beautiful, not only on the outside, most importantly is on the inside. Answer #2: i think i can be beautiful inside and out by my own HEART using my heart to find the good and real friends using my heart by being a good person to the other people around you but the most important thing is being ME is the most beautiful one . being the best person . Answer #1: I like the San San lipstick! Answer #2: To believe in myself is the key to my beauty. Answer #2: being beautiful inside and out, you should be able to instill good values to people around you. Answer #2: Always smile. Your smile brings out all the beauty in you.